Growing up around livestock and raising our own meat, it didn’t dawn on me until I was in college that not everyone has a good relationship with their butcher or meat processor. In Extension I get questions from individuals and even organizations (that have donated meat to a charity) about how to best process the meat for their family/clientele. It is fun for me to visit with people about how to have meat processed to fit their needs and wants. Today I want to share with you some of my tips and suggestions when talking to your butcher or meat processor about meat for your family. 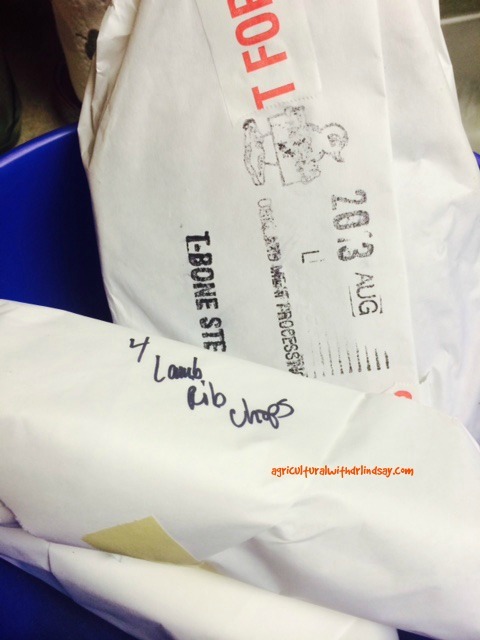 **Note – This article will focus on things to ask your butcher or meat processor, and not focus on the retail level, as most meat is already packaged and ready for us. At a local University meat lab or meat locker you have many more decisions to make and more control over how you want the meat processed/packaged. 1. What do butchers do? In some cases the butcher may be doing the actual harvesting (taking the animal’s life for the benefit of humans) of the animal themselves, sometimes they may get the meat in wholesale cuts in which they break into smaller retail cuts, or they may be doing both. Generally a University meat lab or a local meat locker will do the entire process themselves. Retailers will just get the wholesale meat from a packer and cut it into retail friendly cuts. 2. Identify the needs of your family first. Do you like to grill out? Do you like a Sunday roast? Are you a family on the go that requires convenience? Do you want all of the above? You can have it! But knowing what your end goals are will help the butcher guide you through the process. 3. Family size. Every year at Christmas my parents give Hubs and I a lamb (butchered and cut). Since it is just two of us we have 4 chops per package and the legs cut in half. A larger family will need their meat packaged differently than our family of two. This is a common question asked by butchers. 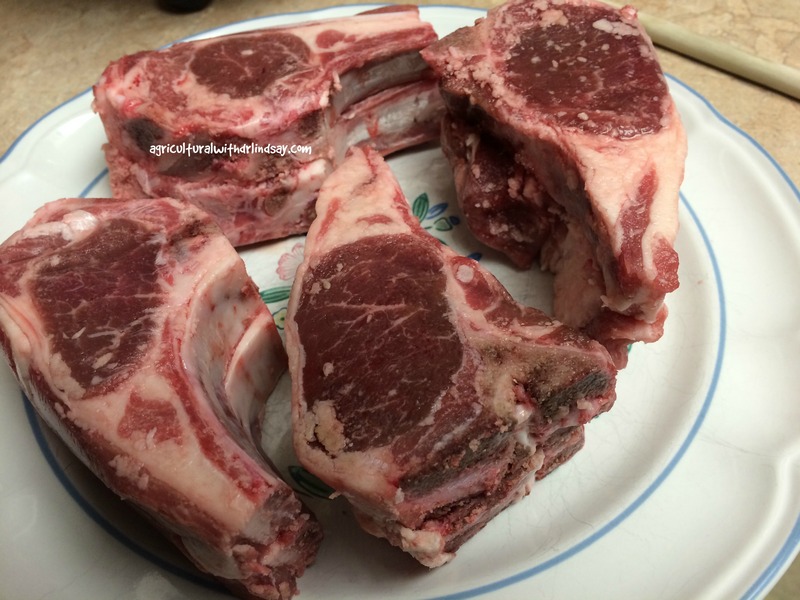 Two steaks and four lambchops to a package is perfect for my family of two. 4. Thickness. I like my steaks and chops to be 1 inch thick. For me this is the ideal size as they are not so thin that they dry out on the grill, and they are not so thick that the inside does not reach your ideal degree of doneness (i.e. well, medium, rare, etc. ), but the outside gets over cooked. Your butcher will cut these to any size you want. In Nebraska we have a Husker porkchop. It is at least 1.5 inches thick, and is smoked! It is amazing. If you want something like this, ask your butcher. 5. Aging. Letting meat age increases the tenderness and flavor. This may take 2-3 weeks for a beef carcass, but the wait is well worth the final product. There are two types of aging: dry (the carcass hangs in a temperature controlled room for a certain time period) or wet aging (usually a certain wholesale cut (i.e.loin, rib) is put in cryovac plastic bags and left to age, a.k.a. in the bag). 6. Lean to fat. If you have a ground product made you can specify how lean you want it. The lean to fat ratio is often shown as 80/20 – meaning the lean number is first and the second number is the fat. The leaner you make it, the less fat it will have in it. This may sound ideal, but it can become tricky as there will be less fat to flavor your meat and keep things moist while you are cooking. I usually get 85/15 or 90/10, and then remove any fat that I do not want. At this ratio my burgers even stay moist on the grill. 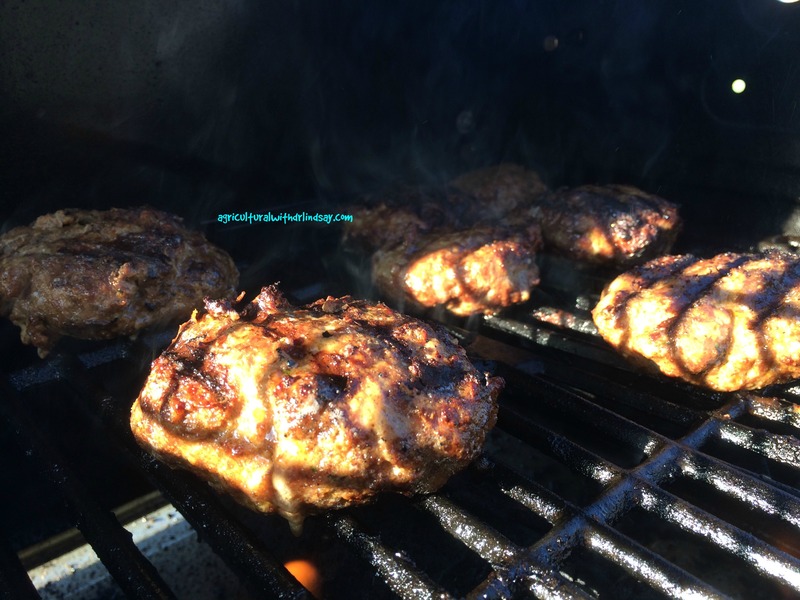 Juicy burgers on the grill. 7. Explore and experiment. You may not know that some cuts even exist, as they are not common in some retail markets. 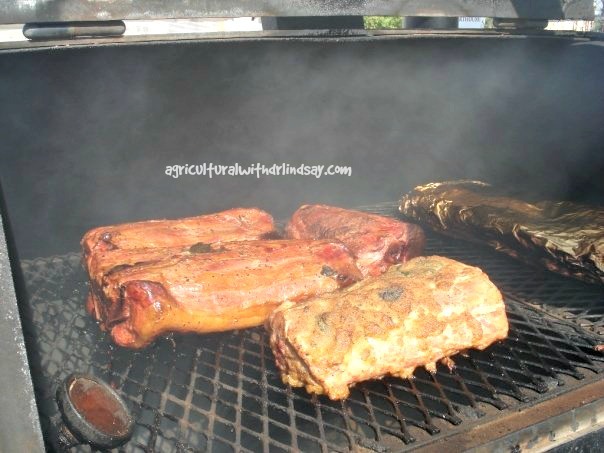 For example, shanks (the forearm) are excellent when cooked over slow, moist heat; tri-tip is a California favorite; Denver steak is a fairly new cut from the shoulder region; ox-tail for soups or stews; and the variety meats (will get to that in a minute). Ask your butcher about trying some new (to you) cuts of meat, or meats that they may process differently than you are accustomed to. Livestock farmers and ranchers help support research to develop new cuts of meat, to learn more check out the Beef Innovations Group here. 8. Variety meats, a.k.a. Offal. These are the organ meats – liver, tongue, heart, kidneys, etc. And yes, they are perfectly safe and healthy for consumption, and they are delicious. 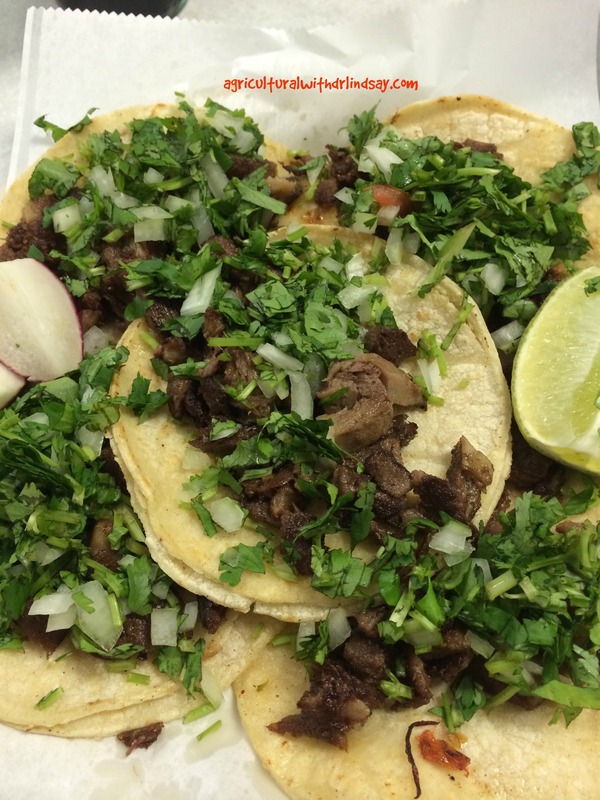 Tongue is my personal favorite, as it can be made into a stew, pickled, pan fried for tacos, etc. (I need to do a post on tongue!). The butcher may or may not ask you about these, as most people do not want them. However, if you are a foodie and enjoy trying new things, I encourage you to take them. Also, in the past I have asked them to be thrown in the trim that will make up my ground product. I am not wasting them, and the vitamins and minerals are being used by my family (and no ones has to know but you :)). In all seriousness, variety meats are usually exported because we don’t consume them as much in America, however, I think you would like them if you tried them. 9. Packaging. Butchers vary on how they will package your meat. It may be in the white butcher paper or it may be in the transparent cryovac bags. While both methods are completely normal and acceptable, keep in mind that meat can go bad in the freezer, it is subject to freezer burn over time. When purchasing meat in a large quantity it is tempting to try some of the new stuff, but moving the older stuff to the front and using it up first will result in less food waste. 10. Get a variety of cuts. If you are like me you may love hamburgers, but you do not want to eat hamburgers everyday. I like to get a variety of meat cuts. I have found though that we generally have a lot of ham and roasts left, and we run out of the ground product first. Knowing our eating patterns helps me adjust my order next time so that there is a better balance of product. 11. How do you like your sausage? If you get a pig processed you will need to decide how you want your sausage made. First, you do not have to have it all made into sausage, you can have some just ground (which is great for stir-fry). Your butcher may offer you several different sausage flavors (mild, medium, spicy, maple, etc.). If you cannot choose or are worried the spicy may be too much for your family, see if you can purchase a small sample of sausage they have in their retail cabinet and take it home for a taste test. There is nothing worse than getting home and being disappointed in what you chose, after-all there is no refund on meat. 12. Smoking. People generally get the belly and hams smoked on a pig. You do not have to, you can leave them unsmoked! This is generally a good option for people who like to smoke their own food and enjoy the DIY. I do prefer to have them smoke my bacon, as I would hate to mess that up! Also, if you realize you may not eat a lot of whole hams, the butcher can cut those whole hams into ham steaks, which can be a better option if you are looking for smaller ham portions. 13. Other processed goods. Your butcher may give you the option to make some of your meat into meat sticks, bratwurst, jerky, chorizo, etc. This is a great option if you want flexibility or are a family on the go. More processed meats will mean less packages of other meat cuts. You will need to determine what is best for you. Beef ribs going into the oven for dry heat cooking. 14. Identify your favorite cuts as non-negotiables. I love ribs, I always make sure I ask for the most ribs possible when I get meat processed. For me this is a non-negotiable item. 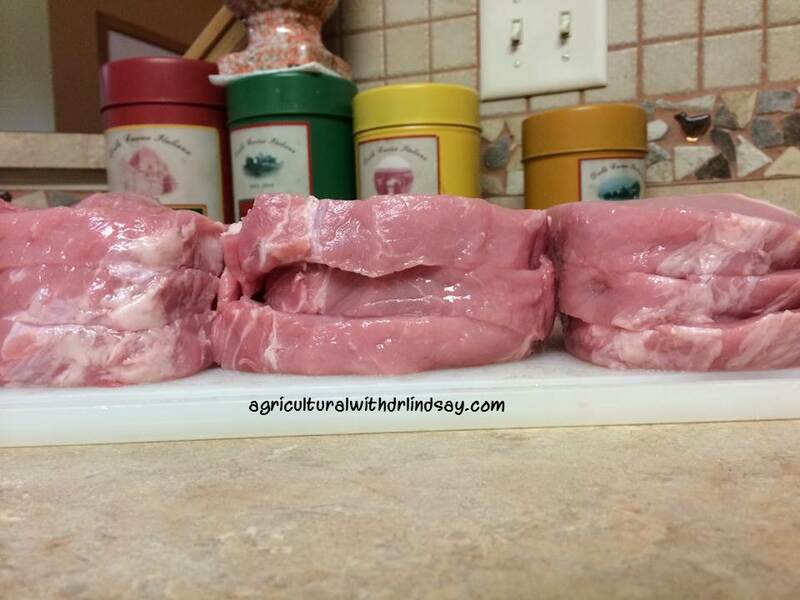 If you are not a rib person, then you may want this meat cut off and want it as stew meat instead. Sometimes placing an order with the butcher can be overwhelming, by deciding what cuts you must have first then building the rest of your order around that will help make things easier. 15. Soup bones. As a carcass is processed and cut to meet your specifications, there may be some large bones that are left. These large bones are perfect for soup bones or as bones for your dog. 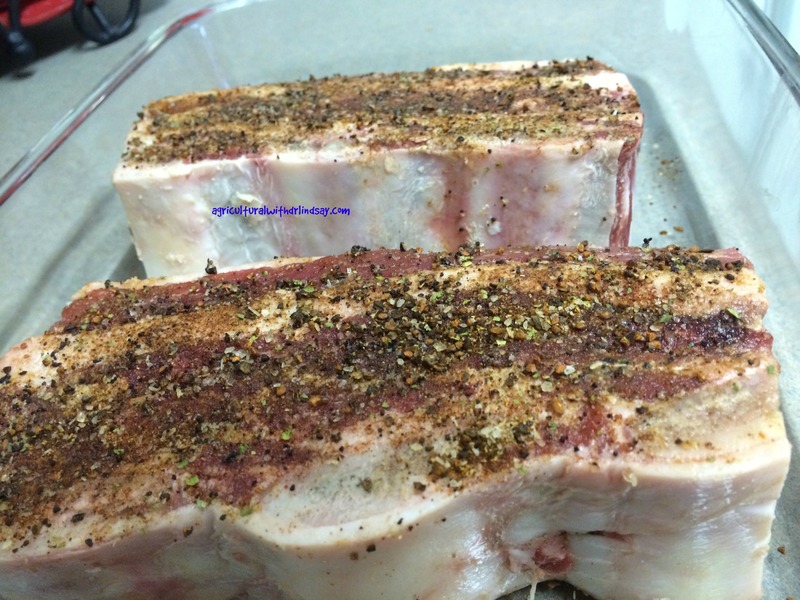 Some butchers can also smoke these bones for you, adding a great smoky flavor to your favorite dish. And ask them to cut the bones into 1-3 inch segments for you. Throwing an entire femur bone into the soup pot is not an option, but throwing in 3-4 smaller bone pieces is a better option. 16. Tenderized. Do you love chicken fry steak/chicken/pork? You can have that! Often times your butcher will take a lean cut, like a ham or round roast and run them through a tenderizer to give you the perfect cut for a chicken fry experience. If this appeals to you, just ask! 17. Write it down. After going through the whole process of making the perfect meat order for you and your family, write down what you ordered and how much of everything you ordered. It may be a long period of time before you need more meat after making a big purchase, and in between those visits you will forget. But if you write down what you did last time, it gives you an idea of what to do next time or where to make adjustments, if needed. 18. What will it cost? If you bring an animal in to be harvested, you will be charged a fee. You may be charged a minimal daily fee for the time the carcass hangs. Depending on the butcher you will usually be charged a per pound fee for the processing. If you get anything smoked, made into sausage, or further processed (meat sticks, bratwurst, etc. ), there is usually another fee. Be sure to have your butcher walk through these fees with you, as it may determine what you do and do not have done. In the past when I have had beef and pigs processed, the total price that I paid for the animal and for it to be processed averaged $3-$4 per pound of product I took home. This is usually much cheaper than if I would have bought it all at the retail level. To me that is reasonable as I got to totally customize my order and I knew where my meat was raised. It may seem like a big chuck of change, but if you average it over the months you consume the product it becomes very cost effective. 19. What if I don’t like something when I get home? While this has never happened to me, I have heard of people not liking the flavor of the cure used for smoked products or the seasoning in processed meats. Call the butcher and let them know. Chances are there was either a rare mistake made somewhere or your taste buds and the flavoring don’t jive. While the butcher’s hands may be tied on what they can do, they may be able to give you a credit on your next order, or they may even offer to exchange what you have for product out of their retail case. If you know you are sensitive to an ingredient or a flavoring, it is always a good idea to ask for a small sample you can take home before committing to a large batch of something. Butchers don’t make money with unhappy customers. 20. Can you watch? In college I worked at my University meat lab. People were always interested to see the process of the harvest and the meat processing. Since we were a University, they could watch at a safe distance wearing the appropriate attire. If this is something you have a desire to see/do, ask your butcher. The worst they can do is tell you no. Most of the time we were happy to have people watch as everything we did was done quickly and as humanely as possible. During processing we closely followed the cleanliness standards we had established. But this will depend on your butcher and what their policy is. 21. USDA inspection. All facilities that harvest, process, and sell meat must be federally or state inspected by the USDA. The USDA ensures that animals are harvested humanely and that the meat they produce is wholesome and safe for human consumption. Butchers are great people to know. They can make meat recommendations, provide cooking tips, and may even have a sample of two for you to try when you stop to visit. They want to make you happy and ensure your meat processing process goes as smooth as possible. Don’t be afraid to ask 100 questions or to admit your a meat novice, they are there to help. What other questions do you have about selecting or purchasing meat? Any other tips or suggestions that I missed? You can even buy in bulk and slice and freeze your own meat! Next BOOSTing your online presence: Is it worth it? Mmm, and now I want a big juicy steak. Thanks for the great info.